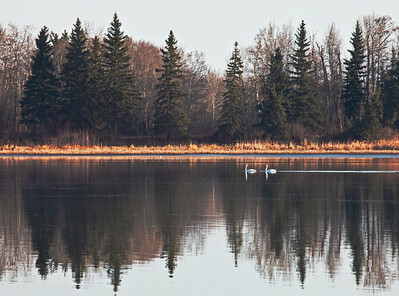 I spend a lot of time at Elk Island National Park because it’s only about 25 minutes driving time away from my home in Sherwood Park. Astotin Lake is a bit of a centerpiece in the Park and some years, it’s a stopover or staging area for Trumpeter and Tundra Swans during their migration. 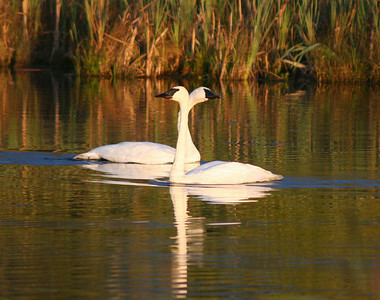 One morning, just by luck I happened across a pair of Trumpeters with their cygnet. It was dawn in September and I had stopped my car in the Park to listen for wildlife. The magical golden light that nature photographers live and breathe was beginning to peak over the treetops. The air was clean and clear and sharp and at just that moment I heard the muted two note jazz trumpet of a swan from the other side of the bushes where I was standing. Everything came together in natural perfection. Golden light was streaming onto a roadside pond and warming up the bull rushes and reeds. Morning mist was hanging, just above the surface of the pond, which was calm and reflective. 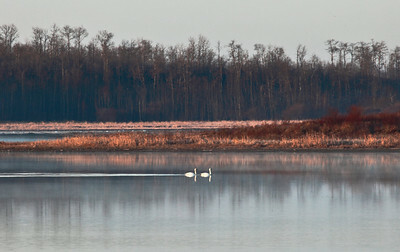 Three Trumpeter Swans - two adults and one cygnet were calmly feeding and swimming in this magical golden light. 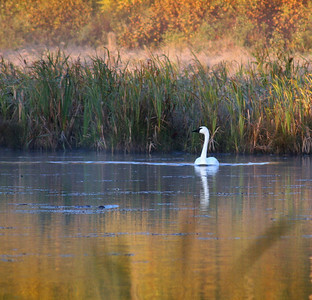 The pure white of the adult swans against the soft misty backdrop of warm autumn colors opened a window to the divine, a magnificent connection to the very essence of Nature. The two adults, swam off to feed in different directions, but then after a few moments, swam towards each other, out of the mist and into the direct light. One of the swans stretched out his neck to rub; affectionately it seemed, against the female as they passed. On the west side of Astotin Lake, just before you get to the park administration offices, there’s a bit of a point that juts out into the lake. A buffalo trail and buffalo droppings lead from the road down to the edge of the lake. The Swans seem to congregate in the water, just off this point. Chest high willow offers a bit of concealment, but I’ve never been able to sneak up on the swans. The first hint of an intruder and the swans are off, running across the water, pounding their wings to escape into the air. The lake was covered, thick with swans. Swans flying and swans swimming, swans woo-wooing and swans trumpeting. It was truly a sound and sight kaleidoscope of swans. And I was the only person there, at that moment, to see them. Unless you want images of the north end of a south bound swan, you only have moments to get your photographs. 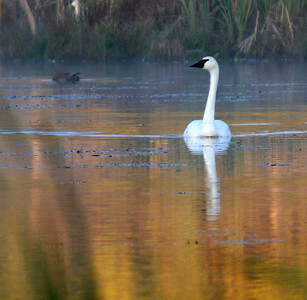 A few stragglers were still flat-footing it around, white swans on white ice in mid November and then they were gone. When I go there now, the lake seems empty and too quiet, though I sometimes still hear the coyotes.